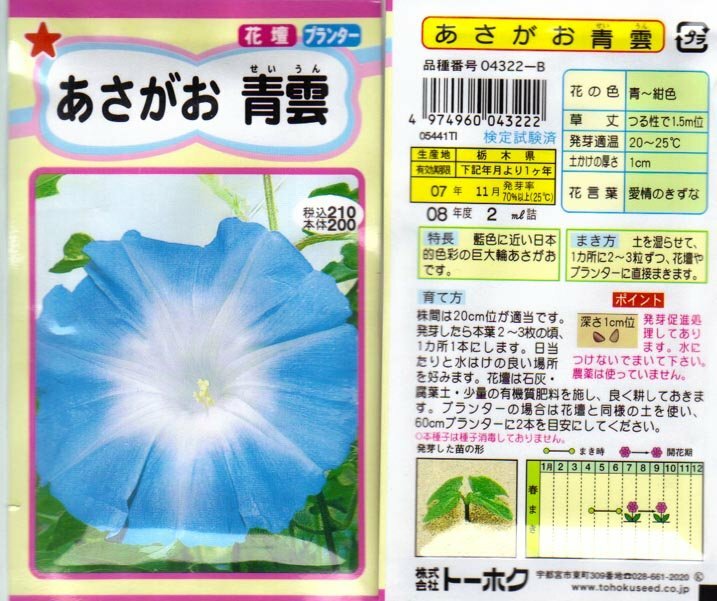 Japanese Morning Glory seeds, Ipomoea Nil, SEIUN (Clear Sky or Blue Sky). Beautiful clear, cool blue surrounds a cloud of pure white in the throat of this large flowering Japanese Morning Glory. You could almost float away on these large blooms! In original package from Tohoku Company in Japan!! These seeds are ARE IN THE ORIGINAL SEED PACKAGE FROM THE Tohoku COMPANY IN JAPAN. These are not home-grown but professionally grown and packaged in Japan. You are getting the pure, original seeds here (not crossed)! All the Japanese Morning glories I've planted this year have had EXCELLENT germination results! 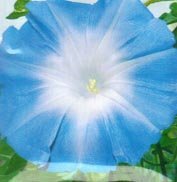 Beautiful clear, cool blue surrounds a cloud of pure white in the throat of this large flowering Japanese Morning Glory. You could almost float away on these large blooms! NOTE: This company's web site says there are approximately 25 seeds per pack, you are getting a FULL, UNOPENED package.